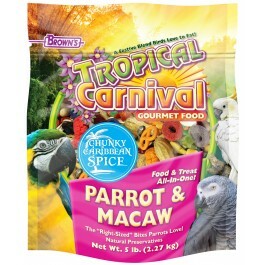 This tropical blend is jam-packed with chunky, chewy, spicy and aromatic Caribbean inspired ingredients, and sized just right for your pet. 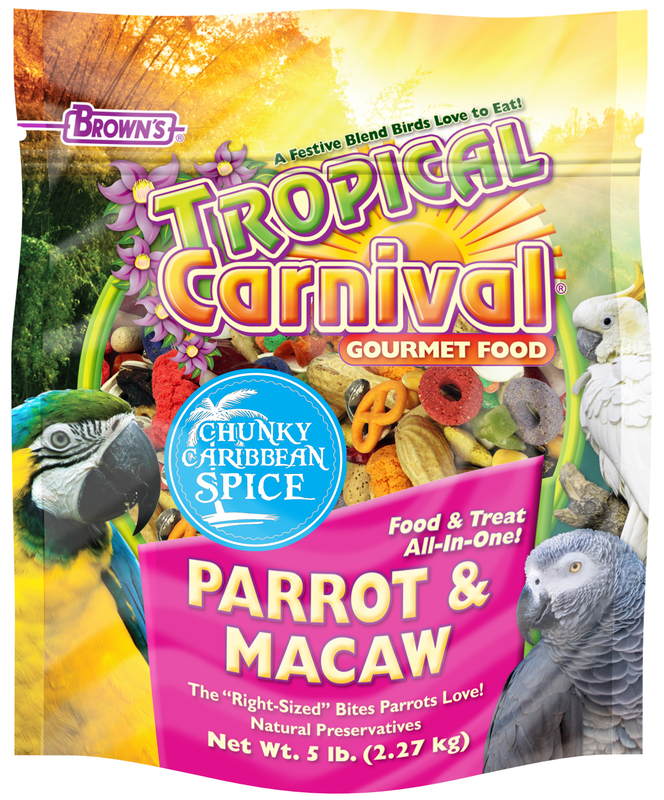 A food and treat, all-in-one, Chunky Caribbean Spice contains a variety of exciting ingredients including our new fruit flavored Crinkle Crisps, berry flavored Baked Pretzels, pineapple dices, papaya dices, coconut dices, protein-packed mixed nuts, spicy chili peppers, aromatic cinnamon sticks, and much more! 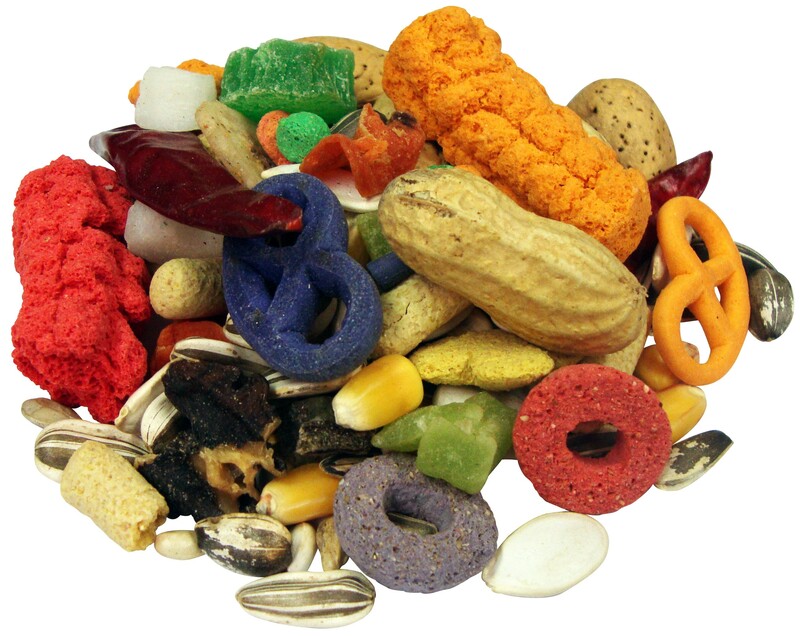 Striped Sunflower Seeds, Safflower Seeds, Corn, Peanuts, Mixed Feed Nuts, Dried Pineapple, Dried Papaya, Almonds, Dried Banana, Dried Carrots, Cinnamon Sticks, Dried Coconut, Dried Peppers, Pumpkin Seeds, Peas, Rice, Potato Starch, Wheat Flour, Ground Corn, Ground Oats, Corn Gluten Meal, Corn Starch, Flaxseed Meal, Soy Flour, Tapioca Starch, Fructose, Dehydrated Peach, Dehydrated Apple, Dehydrated Plum, Dehydrated Apricot, Soybean Oil, (preserved with mixed Tocopherols), Palm Oil, Syrup, Dried Brewer’s Yeast, Baking Powder, Xanthan Gum, Calcium Carbonate, Fructooligosaccharide, L-Lysine, Salt, Vitamin A Supplement, Vitamin D3 Supplement, Vitamin E Supplement, L-Ascorbyl-2-Polyphosphate (Source of Vitamin C), Thiamine Mononitrate, d-Calcium Pantothenate, Vitamin B12 Supplement, Choline Chloride, Manganese Proteinate, Iron Proteinate, DL-Methionine, Zine Protinate, Ferrous Sulfate, Biotin, Zinc Sulfate, Ascorbic Acid (a preservative), Manganese Sulfate, Niacinamide, Sodium Selenite, Calcium Iodate, Folic Acid, Roboflavin Supplement, Pyroxidine Hydrochloride, Cobalt Sulfate, Inositol, Yucca schidigera Extract, Rosemary Extract, Beta-Carotene, Dried Pediococcus acidilacticii Fermentation Product, Artificial Berry Flavor, Natural and Artificial Orange Flavor, Colors Added (Titanium Dioxide, Red 40, Blue 1, Yellow 5, Yellow 6). Pediococcus adidilacticii (min) 7,500,000 CFU/lb.